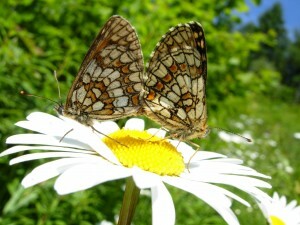 The Tamar Valley provides a home to the rare heath fritillary, Melitaea athalia. This butterfly is restricted to just a few remaining strongholds in Britain, including Blean woodlands in Kent, sheltered heathland combes on Exmoor, woodland in Essex and the Lydford Valley in Devon. One of the smaller and darker-coloured of the handsome fritillaries, heath fritillaries are seen flying close to the ground, gliding and flitting in warm, open areas. 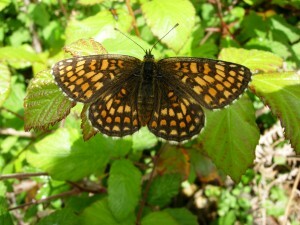 Our local acid soils support its foodplants, such as common cowwheat and ribwort plantain, but like many other species in the Valley, heath fritillaries are dependent upon the continuation of traditional land management practice of woodland coppicing, which creates suitable clearings where the foodplants can thrive. A project was initiated in 2005 by Butterfly Conservation and the Tamar Valley AONB, in co-operation with other local partners (Natural England and Duchy of Cornwall), as well as local landowners. The aim was to restore former heath fritillary habitat to suitable conditions to encourage natural recolonisation and for reintroduction. Reintroductions occurred in 2006 at Greenscombe wood and in 2007 at Blanchdown wood. The former reintroduction has been a tremendous success to date. In 2012 the population at Greenscombe wood continued to expand into recently managed areas, which are funded through a Higher Level Stewardship (HLS) ‘Special project’. It is now considered to be large in size with more than 250 adults recorded in a day, compared to 2007 when only 49 adults were recorded. However, as Greenscombe wood is the only remaining site in the Tamar Valley, the species remains under threat of extinction, as there could be a localised catastrophe (for example, extreme weather or disease). Historic records show sites within the Valley that were once occupied by heath fritillaries, and due to land management funded through HLS agreements, there has been an increase in the amount of potentially suitable habitat. Therefore Butterfly Conservation, with the support of the Tamar Valley AONB, is revisiting sites to survey their condition. Results and recommendations will be available at the end of 2013. The next challenge will be to get the coppice cycle right so that it results in an expansion of the Heath Fritillary population into other Valley woodlands. Participants this year will walk a shorter 15-mile walk. 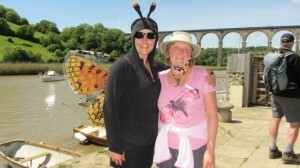 Two previous Challenges raised £2,500 for Devon Air Ambulance in 2012 and £1,000 for Butterfly Conservation in 2013. This year’s deserving cause that will benefit from the funds raised is Living Options Devon.